Why this book is in my wishlist? Well, I watched the movie trailer a couple of days ago and it looked like a great movie. So I thought I should look for the book too. "Mara Dyer doesn't think life can get any stranger than waking up in a hospital with no memory of how she got there. It can. She believes there must be more to the accident she can't remember that killed her friends and left her mysteriously unharmed. There is. She doesn't believe that after everything she's been through, she can fall in love. 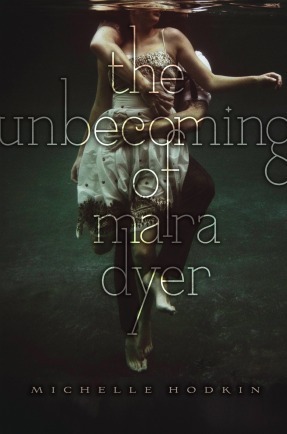 I can't wait to read The Unbecoming of Mara Dyer!! I love the cover! Hey! Thanks for visiting me for the hop! The Unbecoming of Myra Dyer looks so interesting - adding it to my TBR list! I hope you have a great weeekend. I have lots of books yet not much time to read it all.. I saw you spot-lighted on Misha's blog and wanted to drop by to say hello. I have just read Water For Elephants and really enjoyed it (I'll be reviewing it sometime next week) - I hope you like it as much. Nice to meet you, I've enjoyed my visit. PW. Water For Elephants is an amazing book - you will really love it! I'm looking forward to The Unbecoming of Mara Dyer as well! Happy reading! I'm so antsy for the release of The Unbecoming of Mara Dyer! I feel like it's been on my wishlist for ages (probably only been a couple of months, lol). I love your countdown image, the water effect is great. Great books! They sounds very interesting and I have added The Unbecoming to my TBR pile on Goodreads. Popular choices this week! Happy reading. My featured wish is Junonia by Kevin Henkes. Come see why.